Cancer is a major cause of mortality. The sooner cancer is diagnosed and treated, the better a person’s chance for a full recovery. Angiogenesis is essential for tumour growth and metastasis. This project aims to detect and quantify the angiogenesis for the early diagnosis of cancer, and the evaluation of treatment. Quantification of the micro-vasculature is important for the detection and analysis of angiogenesis. 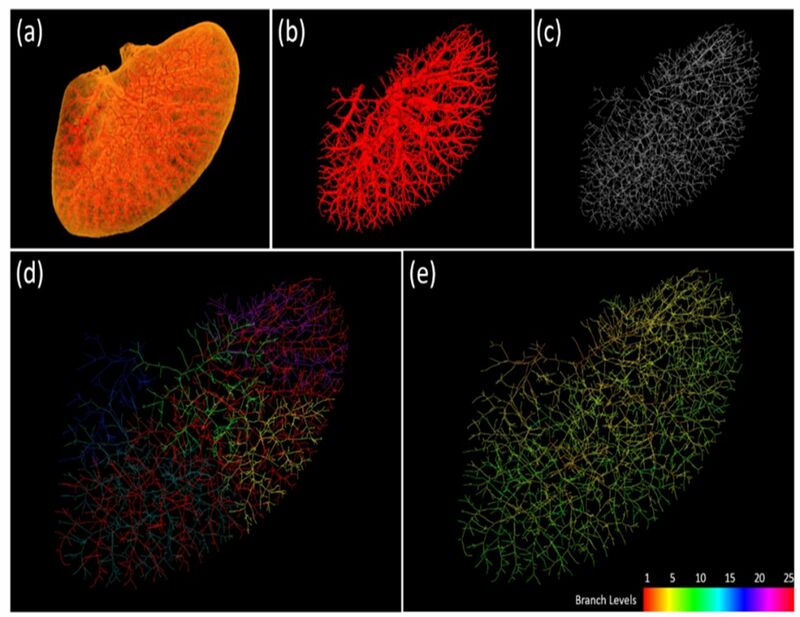 With this project, we have developed new algorithms and brought new insights into the quantitative assessment of angiogenesis by quantitatively reporting the tree structures of micro-vasculature. By acquiring and analysing 3D synchrotron images of mouse brain and hepatic vasculatures, we have carried out experiments to detect and measure subtle proliferation of blood vessel networks, which is associated with the development of tumours. 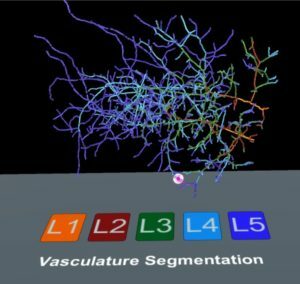 The experimental results show that our algorithms can significantly improve the accuracy of the quantitative analysis results for the angiogenesis, and our statistical parameters defined to characterise the vasculature are reliable and practical for the early detection and evaluation of angiogenesis. 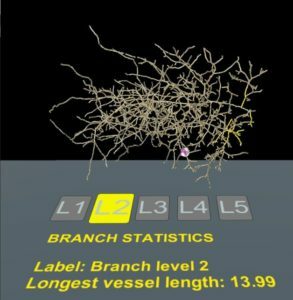 We have also developed a Virtual Reality (VR) based software for interactively visualising the 3D vasculature using Oculus Rift. Figure 1: Quantification of mouse hepatic vasculature: (a) raw image, (b) the vasculature, (c) the vascular skeleton, (d) vascular trees of the liver, and (e) the branch levels of all vessel segments. 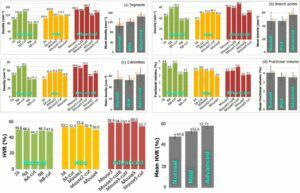 Figure 2: The common use indices of evaluating angiogenesis for different specimens: (a) Micro-Vessel Density (MVD), (b) Ratio of Junction Point to Volume (J/V), (c) Ratio of Extremities to Volume, (d) Fractional Volume, and (e) our defined parameter, High-level Vascular Ratio (HVR) – a more accurate index for evaluating the degree of fibrosis.